The Ma’at Initiation Balancing Program is considered as a unique system designed to initiate the transformation of the mind, body and spirit, in preparation for the coming Golden Age. Its aims is the unification of all three faculties to enable the achievement of a higher state of being. The program aims to explore the knowledge and understanding of consciousness along with the nature and the full capabilities of the human spirit. As we witness profound transformations occurring on this planet within the collective mind – consciousness – and the spirit that goes beyond physical existence, the Balancing Program directs its energies towards the fields of ethics and spirituality, encompassing all religious persuasions. A new technique designed for the rapid relief of all kinds of emotional distresses. A tool for ‘attainment’ allowing a person to achieve a step-by-step evolution of their spiritual, psychic, energy and consequently physical capabilities. Harnesses and cultivates the left and right hemispheres of the brain. Unifies their faculties and awakens the other dormant areas such as the frontal lobe. Thought Field Therapy (TFT) is an alternative to conventional treatments of a wide range of emotional ailments. TFT was first discovered by Dr Roger Callahan PhD, one of America’s most experienced and distinguished Clinical Psychologists. Dissatisfied with conventional therapy techniques, which he found to be time consuming and largely ineffective, Dr Callahan became interested in an alternative therapy called Applied Kinesiology (AK) which addresses the body’s energy meridian system and realised that some of its techniques could have an application in the rapid and efficient diagnosis and treatment of negative emotions. It works rather like acupuncture by stimulating the body’s energy meridians to resolve problems with the body’s emotional control system. However no needles are used, and instead, the patient taps on various parts of the body with their fingers. The results are frequently amazing as emotional problems often disappear in minutes. 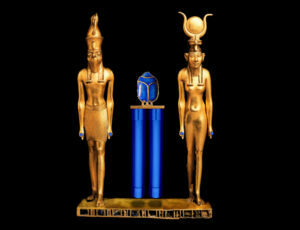 Used by Ancient Egyptians over 2000 years ago, the Rods of Ma’at were cylindrical rods that were utilized by Priests, Priestesses and Pharaohs as a means of healing their energy flows. Initially, the Ancient Egyptians used these as healing tools to treat the most common illnesses. They were also recognized as essential instruments in elevating a person to a higher energy form. The Rods of Ma’at are designed to stimulate physical healing, expand energy awareness and psychic abilities, and awaken the communication to the soul. When held in the hand, they allow a person to harmonize themselves with the different energy sources of the earth, thereby restoring the physical, mental, emotional, and spiritual self to its natural state. Equipped with crystalline gemstones inside, the Rods of Ma’at also attune a person against other disruptive forces. Studies have confirmed that when a person’s energy levels undergo a transformation to an elevated state, the physical form cannot sustain the accompanying spontaneous cell division of the process. Medically, this is known as cancer. Many well-known and acknowledged ideological leaders of spiritual and esoteric schools have succumbed to the disease. The Rods of Ma’at neutralize this process, thereby allowing you to transcend to a higher form of energy state without having your body yield to the disease. The physical world we live in is closely aligned with our Inner Being. By raising our Emotional Coefficient level to that of our Mental Potential level, we gain the capacity to research and understand our Inner Being or Inner World, as thoroughly as we know and understand our physical or ‘outer’ world. We believe that to be human IS a journey into consciousness. The capacity of the Spirit is infinite. Spirit-Self is vastly superior to that of the physical being. The mission of our Balancing Program is to focus on the integration of personal and collective consciousness so that we may be more nurturing toward our world as we develop and evolve. The Balancing Program therefore recognizes the idea that we are personally and collectively seeking to expand our minds, deepen our values, recover our spiritual lives, and use our full capacities as human beings to affect the world around us. It also advances the need to balance the opposites in our lives, so we can begin to get totally in touch with who we are in body and spirit. Our knowledge of life and spirit, the peace of our presence, and the love for all beings are gifts to the world. These three geometric symbols are said to be the first forms through which the universe came into existence. The purpose of the program is to unlock the Higher Intuition of the student as the student comes into more personal contact with the symbols through meditation. At some point within the first six weeks of doing the daily symbol exercise, most people will begin to notice transformation, A new range of abilities, new confidence, and a new outlook, through the release of some emotionally limiting patterns, is guaranteed. By that time they are aware that life “works better”, and thereafter they continue to do the symbols exercise because they realize that they feel better each day and are now anxious and determined to get Balanced. Maat Foundation Therapies: £500.00 [£50.00 non-refundable Deposit]. Please note that the price will rise for the third Earth Initiation.